Nightmare Cinema screened last night before a packed house at the Irish Film Institute. 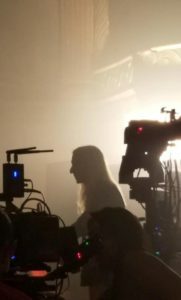 The event included a Q&A session with producer Mick Garris, who will also be screening his earlier hits Critters 2 and Sleepwalkers at the festival. Next month, Nightmare Cinema returns to England for a screening in Leeds on November 9, then travels to Melbourne for an Australian premiere at Cinema Nova on November 23. After that, it returns north for two screening at The New York City Horror Film Festival on November 29. 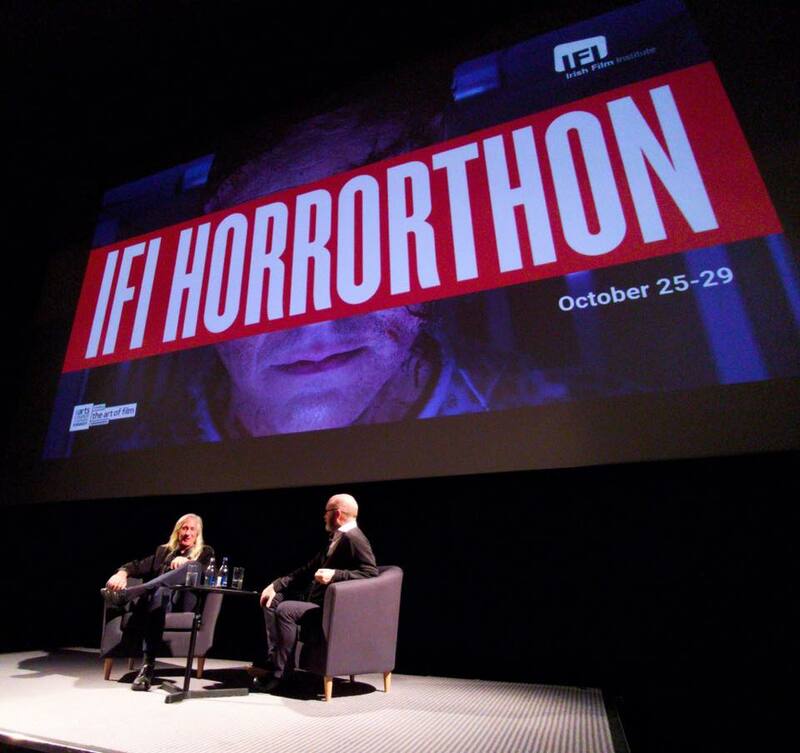 Above: Mick Garris at IFI. 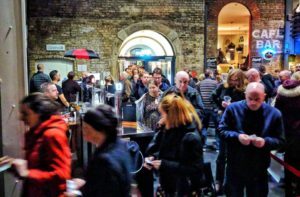 Left: A full-house gathers in advance of Nightmare Cinema‘s Ireland premiere. “This Way to Egress” [is] by far the slickest of the five in terms of production value. Shot in crisp black and white, as with his recent Black Mirror episode, Slade’s segment mines nightmarish, surreal imagery as a woman (Elizabeth Reaser) suffering depression finds herself in a bizarre form of purgatory. — “IFI Horrorthon 2018 – NIGHTMARE CINEMA,” Eric Hillis. The Movie Waffler. 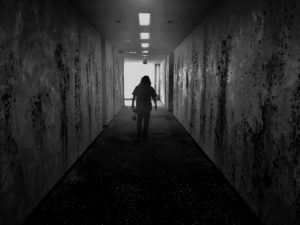 A highlight is David Slade’s surreal black and white offering, “This Way to Egress” – a hideously realised Silent Hill-esque metaphor for mental health. Unshackled from the thematic limits of mainstream horror cinema, it is a treat for the seasoned horror fan. — “Mayhem Film Festival 2018 – Nightmare Cinema,” Gemma Finch. Leftlion. 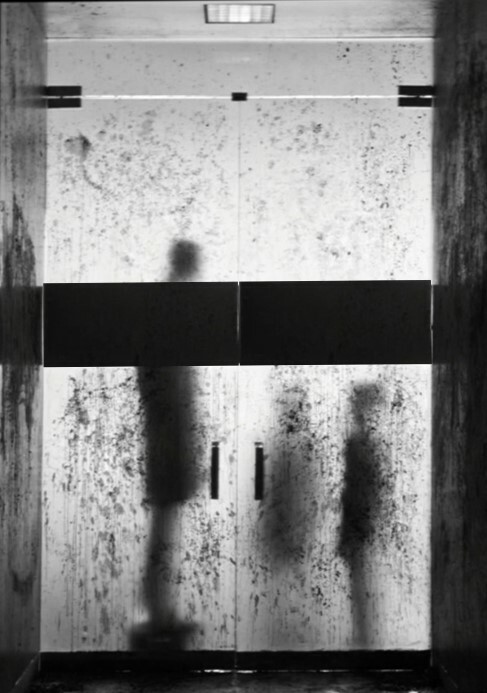 “This Way to Egress” combines the monochrome industrial landscapes of David Lynch with the body horror of David Cronenberg and Roman Polanski’s vision of mental illness — “Review Sitges 51 – Nightmare Cinema,” William Maga. Il Cineocchio. It’s good to see the film connecting so well with its intended audience. Above right: Figures conspire behind frosted glass on one of the nightmarish sets created by Lauren Fitzsimmons. Above left: Elizabeth Reaser in her riveting performance as Helen, desperate to find a way out of a deepening nightmare. So when does the rest of the world get to share our nightmares? Soon. I have it on good authority that an announcement regarding the release is imminent. When that news breaks, I’ll be sure to report it here. 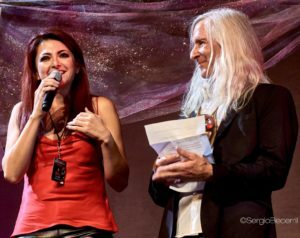 For now, I’ll leave you with a new video interview recorded this week at IFI featuring Mick Garris on the dream that became Nightmare Cinema. 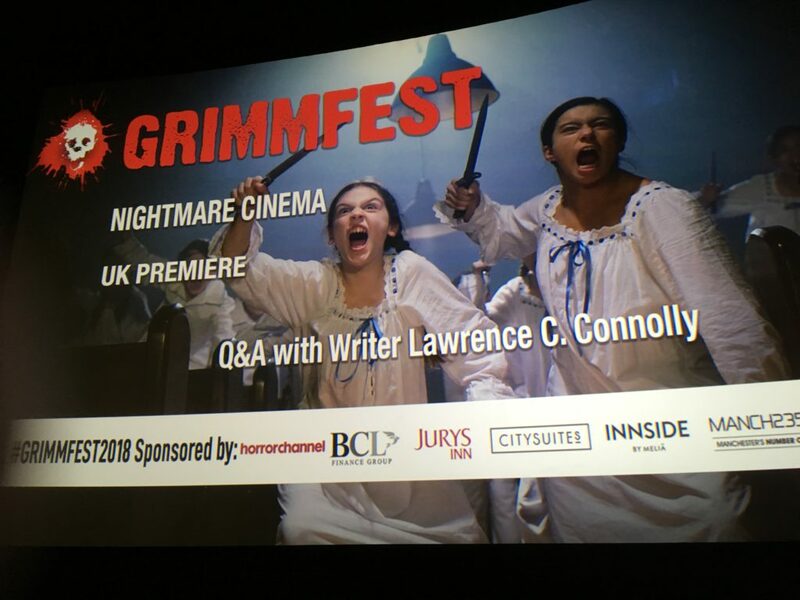 Two weeks after its UK Premiere at Grimmfest, Nightmare Cinema is continuing its run of successful festival screenings, winning fans and garnering strong reviews in the process. In an earlier post, I listed some of the screenings scheduled for October and November. Since then, new screenings have been announced in Dublin, Melbourne, and New York City — all of which should (hopefully) bring us closer to a big west-coast premiere and a release to theatres and home video. A few months ago, following Nightmare Cinema‘s world premiere at the Fantasia International Film Festival in Montreal, I posted links to some of the film’s initial reviews here and here. This month, as a result of Nightmare Cinema‘s prominence on the film-festival circuit, the blogosphere is again buzzing with audience reactions, making this a good time for assembling another list of reviews. Since many of the recent screenings have been in places like Latin America, Spain, France, and Austria, some of the blurbs below are translations. All are accompanied by links to the original posts. If you are proficient in any of the languages, feel free to submit corrections in the comment section below or on Facebook and Twitter (via the buttons at the top of this page). Yeah! You gotta love that last review. And the buzz is still building. 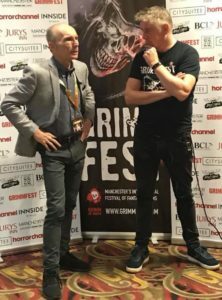 For now, I’ll leave you with an interview recorded at our UK Premiere, in which I tell Grimmfest programmer Simeon Halligan a bit of the story behind the writing and development of “This Way to Egress.” Check it out, and stop back here soon for more festival news and perhaps some details about the upcoming release to theatres and home video. Until this, scop on! I first read Traumatic Descent – Larry Connolly’s short story that would be adapted into “This Way to Egress” 17 or 18 years ago. Soon after I worked with my dear friend Charly Cantor on ideas to adapt the story into a feature-length film which Charly would write. I loved Charly like a brother and he passed away in 2002 leaving a gaping hole in me. I would describe the story as a dark but benign fog that infiltrated my subconscious. It resonated for me in ways that took all of this time to become clear. I’m grateful to Mick Garris and most of all to Larry for allowing me to complete part of this project. It does not fill any part of the hole but it helps. In the Q&A session that followed our UK premiere, I got the chance to unpack the journey in more detail – first in responding to questions from festival director Simeon Halligan and then in conversations with the audience. Along the way, I was able to able to acknowledge the debt that both David and I owe to Charly Cantor, so much so that I felt his presence. It was – as I predicted it would be in an earlier post – like coming home. The day of our premiere also provided the opportunity to discuss Nightmare Cinema and “Egress” at length in a couple of recorded interviews – one with the website FilmDaddy.com and the other with Simeon Halligan (above left) for the festival’s video feed. Both should be available soon. 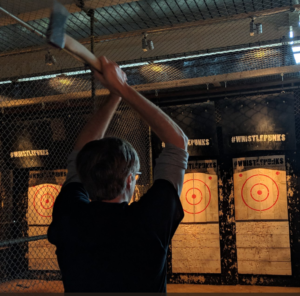 There was even some time for ice-breaking, where I got the chance to throw axes at targets courtesy of an establishment called Whistled Punks. My friendly competitors in the event included Witch in the Window director Andy Mitton and festival director Rachel Richardson-Jones (right). 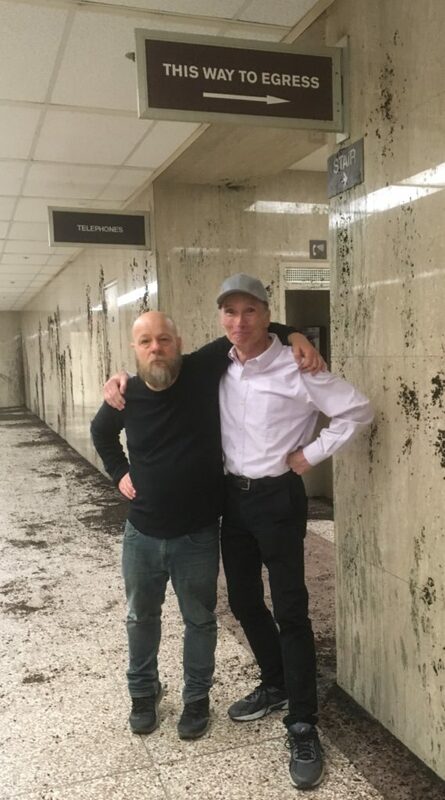 That’s us, posing like ax-wielding superheroes even though it was Horror Channel director Stewart Bridle and Grimmfest photographer Kenneth James who proved to be the true ax-tossing masters. Grimmfest continues apace, wrapping up tonight with an awards reception and the much-anticipated Christmas-themed-zombie-fest Anna and the Apocalypse. I’ve heard good things about that one. Nightmare Cinema’s next festival appearances will include screenings in Stiges, Toronto, Nottingham, Sheffield, Leeds, Dublin, Vienna, and beyond. It’s all part of what we might call the Nightmare Cinema World Tour … so there’s sure to be much more news in the days ahead. Be sure to check back soon. And don’t sleep. Nightmares are coming. 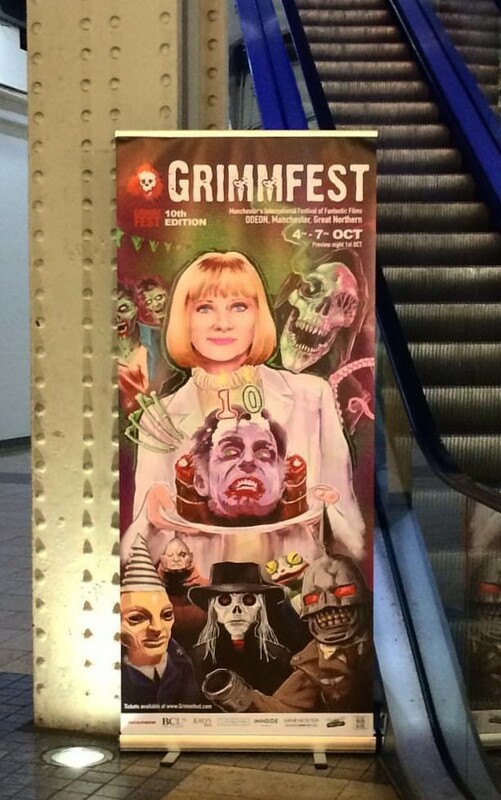 The projected backdrop for the Nightmare Cinema Q&A session at Grimmfest. The photograph is from the “Mashit” episode, directed by Ryuhei Kitamura and written by Sandra Becerril. The 21st-Century Scop in a video interview with festival director Simeon Halligan. 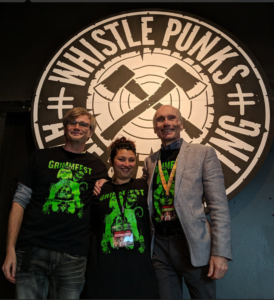 Standing tall with fellow ax throwers Andy Mitton and Rachel Richardson-Jones at Whistle Punks. 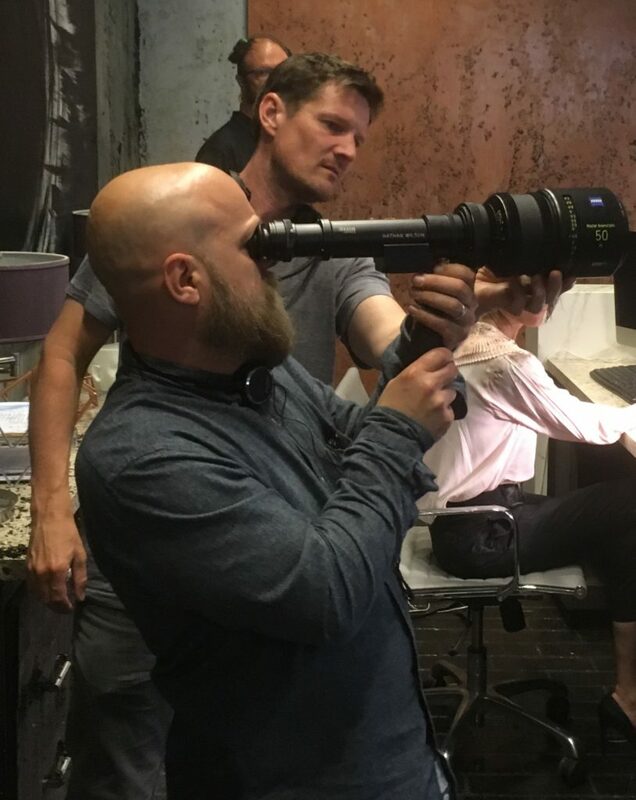 Witch in the Window director Andy Mitton wields an ax. 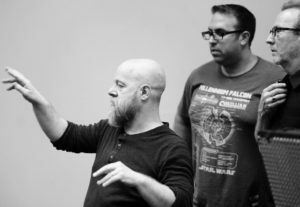 A couple of posts ago, I touched on the UK connections of the Nightmare Cinema segment “This Way to Egress.” That post dealt with my collaboration with David Slade (left) and the late Charly Cantor — both from the Manchester area. In this post, I’d like to consider another UK connection. Eight years ago, the collection This Way to Egress (Ash-Tree Press, 2010) was released at World Horror in Brighton. Featuring a cover illustration by Jason Zerrillo and a re-edited version of “Traumatic Descent” (retitled “This Way to To Egress”), the book launched along with four other Ash-Tree titles: Pieces Of Midnight by Gary McMahon, Tragic Life Stories by Steve Duffy, Walkers in the Dark by Paul Finch, and Lost Places by Simon Kurt Unsworth. The five-title book launch was organized by Ash-Tree’s Christopher Roden and proved to be one of the most successful book events I’ve taken part in. It drew quite a crowd, helped along by the presence of Barbara Roden, who was also on hand to sign copies of her collection Northwest Passage (Prime Books, 2009). Sales were brisk, and friendships were forged that have continued to this day. 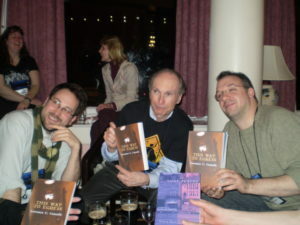 The photo at right was taken in the ballroom of the Royal Albion on the night before the book launch and just a few minutes after the advance copies of Egress arrived. As I recall, there had been some concern about the cover, which had not reproduced well on the proofs. Fortunately, the actual printing looked spectacular, capturing the nuanced play of light and shadow of Jason’s art. That’s Jason to my right in the photo. To my left is Brian Showers of Ireland’s Swan River Press. Look closely, and you will see a hand cheekily inserting another Ash-Tree Press edition into the picture. The hand and book belong to my good friend Simon Kurt Unsworth. 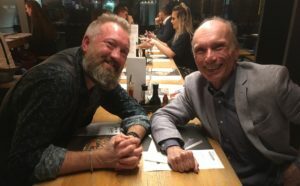 Fittingly, Simon and I managed a get together last night, stopping in at Wagamama’s to catch up on all that’s happened since our last get together at World Fantasy in Brighton, 2013. 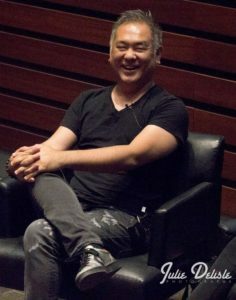 At the time, Simon was anticipating the release of his first novel, The Devil’s Detective, and we had the chance to talk about it and how it came about. You can listen to that interview here. Since then, a second book in the series (The Devil’s Evidence) has been released. It’s a worthy follow-up to the first. Strongly recommended. As I write this, I have just finished a couple of interviews with the local media here in Manchester, and I’m now looking forward to the UK premiere of Nightmare Cinema, which is set to take place in about an hour. I’m also looking forward to catching Andy Mitton’s film The Witch in the Window, which screens later in the evening. I hope to post about both screenings tomorrow. Until then … scop on! Powered by WordPress and delivered in 0.261 seconds using 47 queries.